Spirit Airlines begins flights from Fort Lauderdale Airport (FLL) to Cap-Haitien International Airport in Haiti. Fly Fort Lauderdale to Cap Haitien and Save Big, the airline company says on their web site. No need to book a Spirit airline flight from Fort Lauderdale to Port-au-Prince and drive all the way north to Cap Haitien and surrounding cities. 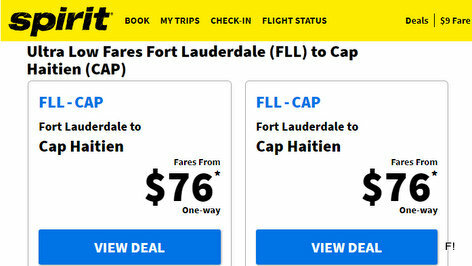 now you can fly straight to Cap-Haitien international airport via Spirit Airlines. Yepp... Ultra low fares from Fort Lauderdale (FLL) to Cap Haitien (CAP). That's what Spirit Airlines promises. The first flight will launch from Fort Lauderdale on Thursday with a no-frills, round-trip ticket costing $297, according the Miami Herald. Mark Kopczak, Spirit's vice president of network planning for Spirit Airline says: "The demand is there for travel to and from Haiti. We saw an opportunity here." « Haiti Police launches "Operation Welcome to Haiti," NO Motorcycles allowed near the Airport! Avan sa se American Ailines selman ki te vole ale Cap-Haitien, konye a gen competition. Too bad. Spirit Airlines is too expensive during the summer and worst they do not fly to Cap-Haitien daily. I am paying 491 from 7/20 to 8/5 with American Airlines and Spirit Airlines is charging 414 plus 70 dollars for bags from 7/19 to 8/5 because they do not fly on Fridays. And Remember carry-on is free with American Airlines.